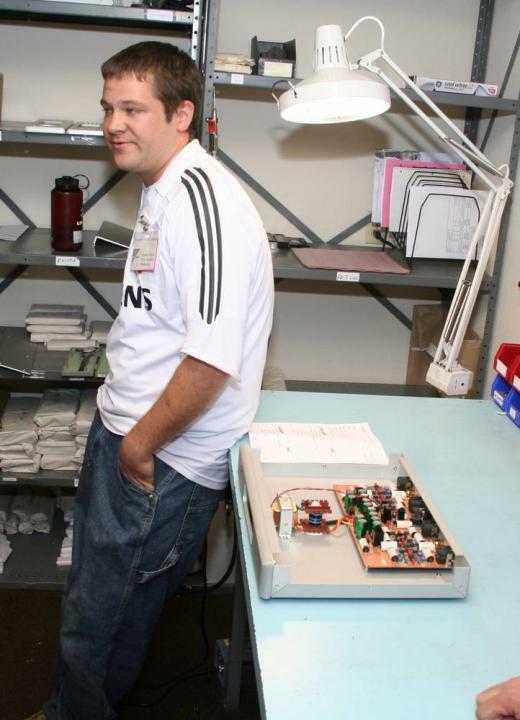 Jordan Huth is one of the three QC engineers who check every Ayre product (and again and again) before it leaves the factory. If he is "checking" the stuff, he must be doing it through physic mind imaging or eyes in his *** or back of his head, looks like he is loafing off, holding up the table, or scratching an itch somehwere on his behind. If this is how they "checkout" the stuff I'm underwhelmed. Hey DUP - lighten up! It's a picture. Look at all the unused real estate. And we are talking Ayre here, an expensive make. I posted a remark about wasted real estate and was erased. What? Did I strike a nerve on the advertisers? >I posted a remark about wasted real estate and was erased. What? Did I strike a nerve on the advertisers? I'm the moderator of this Gallery, and I'm not aware of your comment being erased. It might have been a mistake somewhere along the way. If so, I apologize for the inconvenience. You should feel free to express your opinions without threat of being edited, so long as your opinions are expressed with respect and due consideration. Thanks for contributing to the Gallery and Forums.